Jordan Spieth showed a bit of frustration during his opening round at the U.S. Open on Thursday, throwing his club after a seemingly perfect approach shot on the 17th hole rolled all the way across the green and trickled down into a bunker. “You’ve GOT to be kidding me! How is that in the bunker!” he yelled after his second shot on the par-4, which Spieth was playing as the 8th hole. 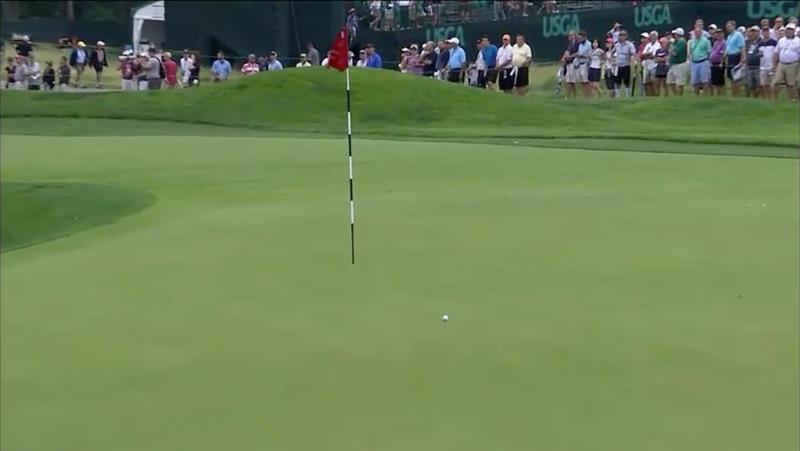 When Spieth’s ball lands and starts to spin back, it looks like it will settle close to the hole for a very makeable birdie putt. But this is Oakmont, one of the hardest courses in golf, and the greens are brutally fast. Spieth can’t believe it, and let his frustration out by giving his club a toss at his bag. Even though the nearby fans did chide Spieth a bit for his club-toss, you can’t really blame him. Rain has twice suspended the first round at Oakmont, which must be all the more frustrating for the golfers, who will struggle to get into a rhythm on the course. But the rain could actually be a blessing at Oakmont. If it softens up the greens, fewer shot — especially perfect ones like Spieth’s here — will roll into bunkers. Spieth is currently even on the day, though whenever play resumes he’ll have a tough up-and-down for par.